Features July 4th, 2009 attack on the Airborne 4th Brigade 25th Infantry Division at RC East, 4/25 ABCT Area of Operation South Eastern Afghanistan 3-509 Infantry Airborne Battalion. The documentary features video taken that day by soldiers, as well as propaganda video found on insurgents weeks after the battle. July 4th, 2009 at 0535 the first round impacted Combat Out Post Zerok, E. Paktika, Afghanistan as Able Company 3-509 jumped into action to respond in kind. Our deepest gratitude for all the men who fought bravely with PFC Aaron Fairbain, and to all the men and women continue to serve for the greater good. God bless you. 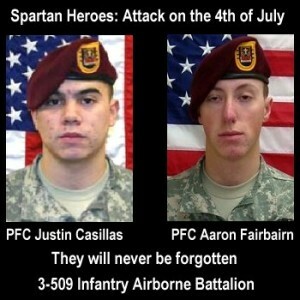 This entry was posted in 4th of July, Aaron, Aaron Fairbairn, Video and tagged 1lt jonathan mummert, 1lt mike bassi, 3-509 infantry airborne battalion, 4 25 abct, able company 3-509, afghanistan, airborne 4th brigade 25th infantry division, battleground afghanistan, bowe bergdahl, combat out post zerok, cop zerok, cpt bryce kawaguchi, documentary, e paktika, July 4th 2009 attack, paktika province, pfc aaron fairbairn, pfc josh fuller, pfc justin casillas, rc east, spc david fantell, spc gregory jemison, spc james channer, spc robert ham, ssg jarrod mahfouz, the attack on the 4th of july, video on February 19, 2013 by aaronfairbairn. Craig on PFC Aaron Eli Fairbairn R.I.P.